All orders and inquiries to: Mulberry House, Winterborne Stickland, Dorset DT11 0NT. 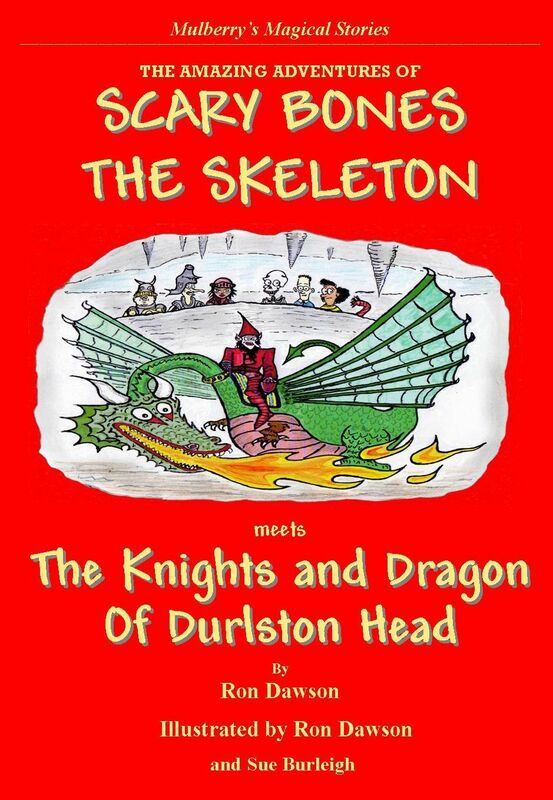 In this sixth adventure Scary Bones, Sasha, and the Red String meet the Princess Tilly Whim and two Knights, Sir Moanalot and Sir Groanalot. The Princess is trying to save Lord Loveydovey who has been imprisoned by the mad bad magician Badtrix and his fire-breathing dragon, Volcano. In all of his adventures Scary Bones is accompanied by a magical and rather strange piece of red string, which is no less brave than Scary Bones himself, and indeed rescues and saves him and the children in many scary situations. Every Scary Bones book comes with a mysterious sealed envelope which cannot be opened until the very end of the story. This adds excitement and mystery to the stories which both children and adults love and share. Leo and Jasper were entranced by this story! They loved the funny names. Now they want to go to Durlston Head! ’ Mother, Dorset. ‘Ellie loves this latest story. She says it is 'the best ever' because it has a Princess in it. In her own words, it was 'awesome.’ Father, Pickering. ‘It is a dramatic and magical story to read with crazy characters and funny pictures’. Bella. ‘I really liked the story because you don't know whats coming next.’ Josh. ‘I liked the Dragon. It was a really good character and the story was exciting and really good.’ Poppy. ‘The children loved the book. They really enjoyed the characters of Tilly Whim, Badtrix and the knights. We can't wait to see it in print.' Pupils and Teacher, Sticklands School, Evershot, Dorset. ‘A ginormouslystupendously good book!.’ Ruby. ‘In the end we were relieved that the children made it back. A great book to read.’ Josh. ‘I liked the dragon being a girl because they are normally boys.' Lily-Mai. Pupils of Damers School, Dorchester. ‘A fun story withscary parts which kept us on the edge of our seats. The story has everything anyone could want from a reading book. The dragon was terrible but we loved her!!! The characters were brilliantly described and they will help us in writing our own character descriptions.’ Teacher, Wareham St Mary School, Wareham. ISBN 978-0-956173270 RRP �4.99 All books ordered direct from Mulberry Tree Books are delivered with FREE Post and Packing ! If you would like your book signed by and with a message from the author please send your message to mulberrytreebooks@talktalk.net when you place your order. Mulberry’s Magical Stories for Children Series are traditional style stories for reading to children from five years upwards or for reading by more able readers up to 12 years. They were never really happy a lot. High on the cliffs above the seaside town of Swanage stands a giant globe made of stone. Above the globe is a stone Castle. These are the settings for the sixth Scary Bones’ adventure with the Red String, Sasha and Ben.